Service; From loose lug nuts, leaky oil filter o-rings, to not enough oil, then being told after paying $300 for a service that I should check everything before riding. Yeah, ok, lets see how long youd get away with that in the automotive world. The real annoying bit is after dropping my ATV off for service, and not hearing anything, I call and leave a message for an update. Get called back and asked, "when did you drop it off, as we have no record of it being brought in." Charged for a lawn mower service that never got done after they had had it for 2 weeks. They did promptly get the lawn mower serviced, provided me with new lug nuts, and apologized for the oil mess. Parts; O-rings for a pressure washer hose and gun I bought from them, being told by the parts guy he doesnt know how to look it up. Why are they in parts? Sales; Ive always been well looked after when I am buying new...however, Ive purchased a lot of equipment and demod many ATVs and after the last demo I cant say I want to purchase from here again. 3 Stars, because even though the experience isnt great, it is still better than the non-japanese brands. You just have to count silently in your head to 10 when they drop the ball. Over the past 2 years we have purchased 2 vehicles from Penticton Honda. I highly recommend sales consultant Chantelle Karoud. We purchased a car and truck through Chantelle and were extremely happy with her customer service. Chantelle is a great listener and worked hard to negotiate a price that we were comfortable with. Chantelle also follows up with her customers to ensure that you are happy with your purchase. I was heading out for a ride on my 2016 KTM and noticed I had a flat tire. I went to Honda service to see if they could get me in on the fly. He mentioned they were pretty busy but after talking to the technician he mentioned they would do it for me right away. It was a great experience from start to finish. I have had poor experiences at other recreational shops before and this was not one of them. Kudos to Penticton Honda Centre for going above and beyond to solve a "one off" problem with a weed trimmer. The new machine that you provided us is excellent and you have renewed our faith in Stihl products. Penticton Honda Centre is an asset to Penticton and we will always enjoy doing business with you. Knowledgeable and friendly staff. 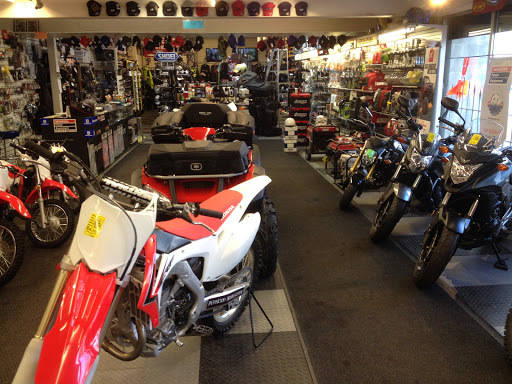 Good selection of dirt and street motorcycles and accessories. Ryan cutler is extremely knowledgeable and helpful. Great staff awesome service super selection of bikes side by sides and Honda products. And Stihl products. Good selections, a bit expensive but the staff tends to be knowledgeable and fun to talk to. Always helpful and knowledgeable about their products. Reasonable shop rates too. Great service and nice staff!